Choosing a bed is an important decision that impacts on the quality of your sleep as well as your overall health. With this in mind, Mervyn Ewertse founded Bed King in 1999 to live out his passion for helping South Africans to enjoy better sleep and healthier lives. His first store was located in Durban Road, Cape Town, and almost two decades down the line, Bed King remains a family-owned bedding retailer – now with 13 stores nationwide. These days, discerning bed buyers can head to Bed King stores in the Western Cape, Gauteng and Nelspruit region to find a scientifically-tailored sleep solution. Bed King achieves this with the use of the exclusive Comfort Solutions Lab®, which utilises pressure-mapping technology to accurately determine clients’ comfort and support needs, all within five minutes! Instead of clients jumping from one bed to the next, unsure of which one is right for them, the Comfort Solutions Lab® provides them with mattress recommendations tailored to their specific needs. In short, the Lab® takes the guesswork out of choosing a mattress. It took no less than three years to find and refine the technology that underpins the Comfort Solutions Lab®. The Labs® were rolled out to Bed King stores countrywide throughout July 2018. Based on pressure-point tech developed in Canada to streamline everything from healthcare to tyre manufacturing, this trailblazing system is poised to change the bed-buying landscape considerably. 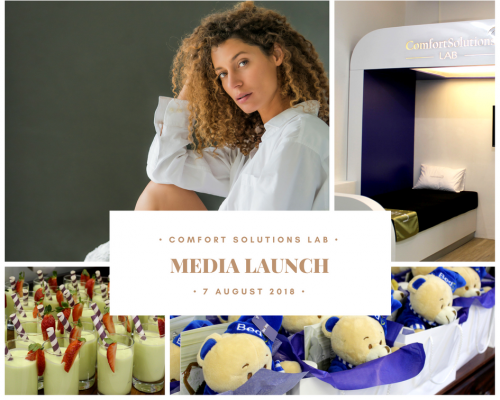 The official Comfort Solutions Lab® media launch took place at the Bed King Green Point branch in Cape Town on Tuesday 7 August. Managing Director Mervyn Ewertse welcomed bloggers and journalists who were invited to the big reveal with a light breakfast and overview of how Bed King developed as a brand over the years. Assistant to the MD Carla Ewertse then introduced the Lab® and invited guests to experience the pressure-point technology for themselves. Once each journalist and blogger had received their mattress recommendation, they were then guided through a bed yoga session conducted by a yoga specialist. The Comfort Solutions Lab® technology is now fully operational at all Bed King stores throughout South Africa (the Nelspruit branch is not yet fully fitted but will be soon). Be sure to visit your nearest branch to experience this revolutionary technology in person and find out which bed is scientifically suited to your comfort requirements.